Word came a few nights ago that my buddy, Bill O'Donovan had departed this life. I am sad. Bill was one of those guys that you sort of figured would live forever. I first got to know him when I was at the Presidio as the pastor for two congregations. He was retired, a Colonel lawyer type who had started out as an infantryman in the Big War. In fact, It was not hard to imagine Bill right out of central casting ahead of John Wayne. 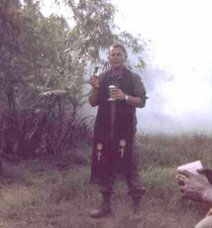 Bill was an infantry company commander and in many fierce battle in the South Paific, proved the meddle like so many of the greatest generation. Bill had stories to tell, like jumping in a foxhole full of snakes--he loved to tell it. But, the one I remember mostly is one of great coincidence where he wrote a very poignant letter to the family of one of his enlisted guys, attempting to comfort them in their loss. Forty years or even longer, he was at some function in San Francisco, having become a successful Army and civilian attorney, when the featured speaker referenced an O'Donovan that had written this wonderful letter to his grandmother--A letter that had gone a long way in sustaining her throughout the war. The grandson had saved it as a cherished possession. Imagine his surprise when he discovered Bill. To the Colonel, such coincidences were really not chance at all but moments to savor. Bill had thousands of stories. I loved to listen. He was a stalward at the 1100 hours service, along with his wife, Jane. He loved to be around the military--to smell them he would say. What an inspiration! When I was in Korea and felt that I wanted to begin an organization for Vietnam vets to help Amerasian (American fathers/Asian mothers, often ostracized in their native country) and Vietnamese kids who had come to America, Bill encouraged me, He felt we all had some collective guilt in running out and leaving the Vietnamese with empty promises. Although he would never own up to it, Bill was one of the shakers and movers in developing the policy of allowing the Vietnamese who had helped us come to America. During that time, I remember the news accounts which were highly critical of the policy. Bill and I were watching as the planes landed from Vietnam and those women and children got on and off buses. I will never forget what the Colonel said: "if that (meaning the Vietnamese) doesn't melt hearts, then nothing will. It did and any opposition to the policy faded away. Bill was not in the least surprised. He was a great American patriot and had faith in the spirit of America he would say. The Colonel contributed. It was who Bill was. He touched life. 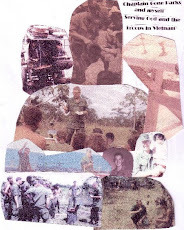 Bill became the treasurer for our fledgling non profit, Vietnam Vets Southeast Asian Children's Project. And, it was also Bill who jokingly said, "I don't think our organization is needed." What he meant was that we discovered quickly that of all the emigrant groups, the Vietnamese needed the least help. In San Francisco, at least, every kid had three paper routes and after six months, was speaking better English than most of us. Bill and I would hang out at Liverpool Lil's, a place just off the Presidio. We met there almost every week. And, when I went to Arizona for an assignment, I bought a print of Liverpool LIl's and gave it to him. Bill and Jane lived on Divisadero Street in a great sectiion of San Francisco called Cow Hollow, They were the epitome of good hosts--old Army. It was all silverware and elegance. What always fascinated me about Bill, among so many things, was the fact that he absolutely broached constantly the perceived age barriers. Forever young, he loved chaplains and was as comfortable with the young guys as the old ones. To say that Bill was a renaissnce man is somewhat of an understatement. For those who have seen my favorite TV minseries or read the book, Lonesome Dove, Bill is without a doubt, Gus, the perpetual and ubiquitous renaissance man. My world is not the same without Bill. But, I will have to say that I have comfort in something Bill said over and over: every day has been a gift. The Colonel was a gift.